This year is the 30th anniversary of the creation of Pee-Wee's Playhouse Christmas Special, the opening sequence of which I had the honor of animating. It all started with an unexpected phone call from producer/director Prudence Fenton. Filming was to start in just a few days and she was inquiring about my availability to shoot the stop-motion animation for the title sequence. Prudence also requested that I sculpt a clay fox and several other animals to animate and have ready immediately. I was more than willing but considering the unusually short notice, I could only create the clay fox puppet ahead of the shoot. Getting right to work, I wondered what I was getting myself into, and the project did have many difficulties, but my efforts paid off in that they resulted in an Emmy nomination! The producer left it entirely up to me to design the fox as I saw fit. 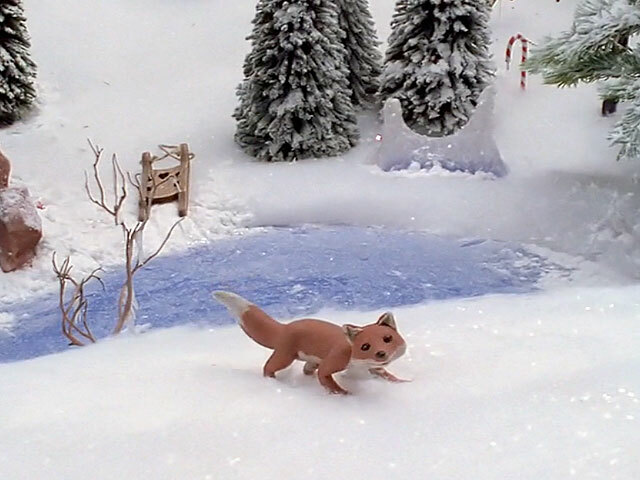 Because the fox had to be constructed from clay for a "claymation" look, I knew the task would be problematic. The fox would be required to run, which demanded extreme stretch and compression poses, often a worst-case scenario when working with clay puppets. I needed an armature that would support and hold the puppet together but not push through to the surface of the clay while it was being animated. Working in my home studio, I decided to try an experimental system consisting of bones made of brass tubing and joints made of solder wire, all epoxied into place. The idea was that solder, as opposed to the much stiffer aluminum wire that was normally used, would move easily with the least resistance. I worried that solder could only bend back and forth a limited amount of times before breaking but I figured it would at least last through one shot. Once the armature was ready, I sculpted the fox over it using plasticine clay and black beads for the eyes. The finished clay puppet was about five inches long. Several days later, I arrived at the shooting stage. 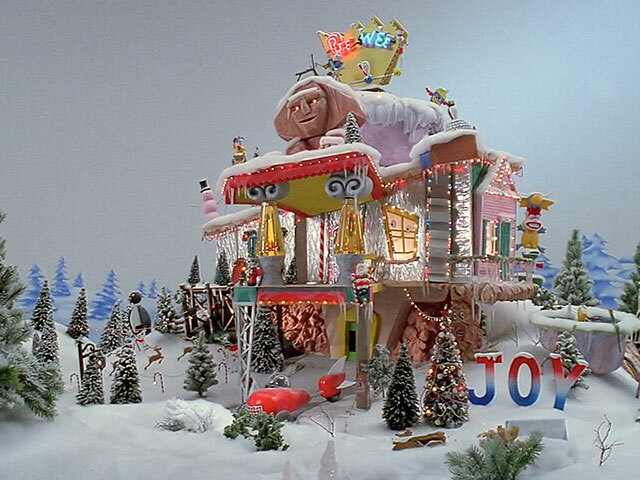 Prudence had arranged for a gigantic set to be constructed as a winter wonderland and centered on the original Pee-Wee house from the TV series. The camera crew had a motion-control system to film the long, elaborate camera movement over the set. I coordinated with the camera operator to plan when and where I would perform the stop-motion animation. The shot extended over 50 seconds long; fortunately, I did not need to animate the entire running time. Slightly swinging on wires during exposure blurs the fox. Back then, there was no “video assist” or "frame grabber" to monitor the stop-motion animation as it moved along. The act of animation was a matter of focused mindfulness. 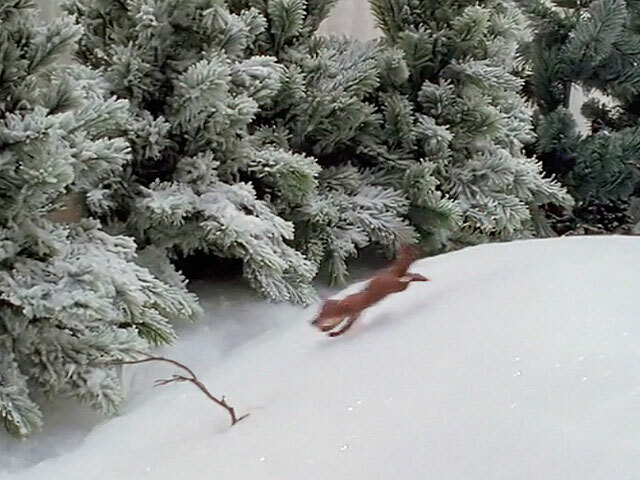 Since the fox needed to run and therefore be airborne much of the time, I used a "flying rig" to suspend the clay puppet with extremely thin wire. I had to pose and re-sculpt the clay for every frame. Just before shooting a frame, I would tap the puppet to allow it to swing slightly on the wires. This resulted in motion blur for smoother animation. Model makers fabricated some excellent "mechanical" elves for me to animate, but they could not reliably hold a pose. Fortunately, some sticky wax in my tool kit saved the day. It’s a substance that works wonders under the right circumstances. The end of the shot features the Pee-Wee house which is known for the moving sphinx head on its roof. Prudence requested that I animate the head as though it was getting stuck in the ice and snow. I felt this might look like a stop-motion glitch instead of an intentional action, but went along with that plan. The entire shoot was time-consuming and ended very late at night. It seemed that all was well and the animation successful but we would not know for sure until the film came back from the lab. The elves pass presents along to drop in the well. The morning following the shoot, I received a call from Prudence who had bad news. There had been a camera problem and the shot was ruined! She wanted me to come in right away for a re-shoot. I was very concerned because the clay fox was thrashed at that point and would require refurbishing. I could only hope that the solder joints would last through another shot. Since I was tired from animating most of the night, I felt disheartened at the prospect of having to do another long shoot without a proper break; however, we did it over again and it turned out well enough. Incidentally, the armature inside the clay fox broke during the second take, but I somehow I managed to make it through to completion. Due to the breakage, the fox’s movement does glitch a bit in its final moments on screen. In theory, the first take had better animation. Oh well! Pee-Wee's Playhouse Christmas Special ran as an hour-long special and unlike the Pee-Wee TV series, which had been a morning show, it was broadcast in prime time. The guest star list was extensive and included Zsa Zsa Gabor, Grace Jones, Cher, Whoopi Goldberg, K.D. Lang, Little Richard, Joan Rivers, Magic Johnson, Dinah Shore, Oprah Winfrey, Frankie Avalon, Charo, and Annette Funicello. It was a wonderful and fun production, and I was pleased to see my name prominently displayed on the credit roll along with the other animators and among the many celebrities. Looking back, it seems that we animators were considered special and given much more respect and acknowledgment than was usually the case. 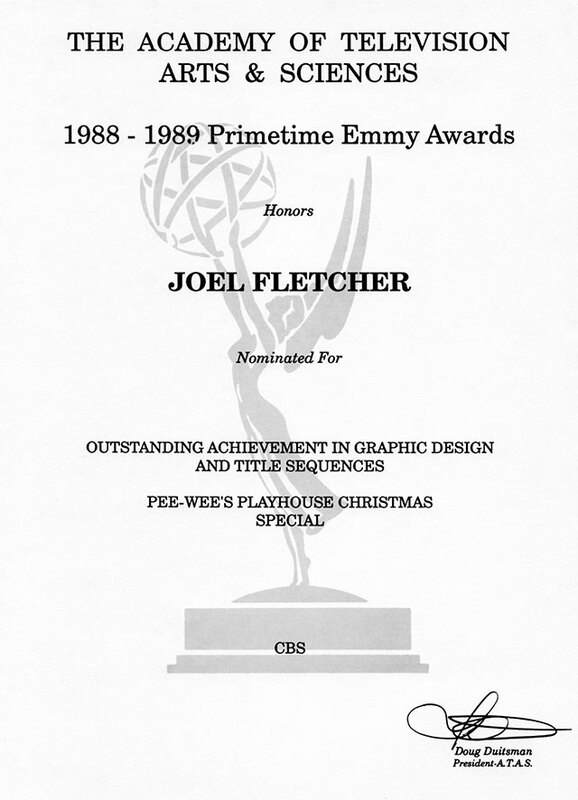 Speaking of recognition, shortly after the show was broadcast, I was nominated along with Prudence Fenton for an Emmy for Outstanding Achievement in Graphic Design and Title Sequences. I couldn't believe it! As the date for the Emmy awards approached, I received some bad news. The category for which I was nominated failed to receive enough votes to meet a specific threshold, which if not met would mean that the Academy could not award a win to any of the nominees! Apparently some of the Academy members declined to vote for the less than “high-profile” categories. What an absurd and unfair rule! At least I was warned in advance. Prudence refused to attend the event, apparently in protest, but I accepted the "no win" situation and decided to go anyway along with my girlfriend (later wife), Cheryl. Being the type who is not keen on public speaking, I was somewhat relieved to not have to wonder if I would win and give an acceptance speech, so I just enjoyed the evening. For those interested in more behind-the-scenes tales about the Christmas Special, I highly recommend a book, for which I was interviewed, Inside Pee-Wee's Playhouse by Caseen Gaines. Also, a Blu-ray version of Pee-Wee's Playhouse Christmas Special was recently produced from the original film masters and scanned in high-definition. The show looks better than ever!